In 2009, Joe Griffin, a musician and owner of Bamboo Room studio, purchased a MusicCord-PRO power cord to use with his guitar amplifier. 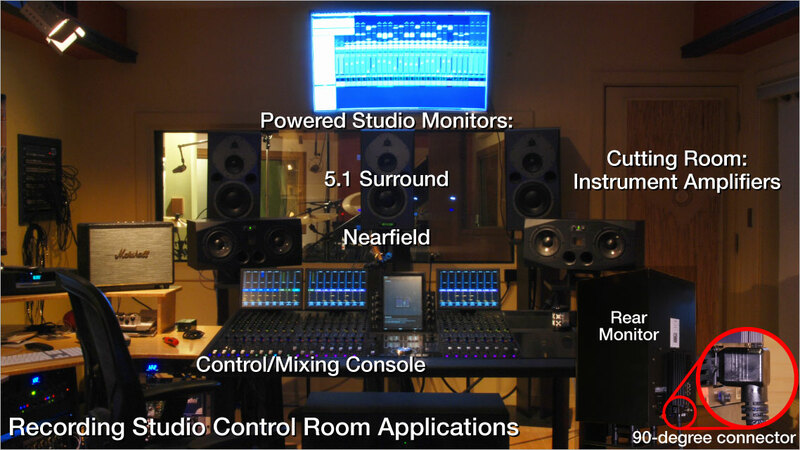 By the time Joe purchased the studio in 2015, he had years of experience using MusicCord-PRO with various amplifiers, hearing how the power cord improved clarity, transient performance, tone and reduced noise. For Joe, the purchase of Bamboo Room represents the achievement of a lifelong professional goal, the opportunity to create and help others create music recordings of the highest quality. Joe is a perfectionist, and a tour of Bamboo Room reflects his passion for perfection. Everything about the studio from the cutting rooms, instruments and amplifiers, and all the various recording equipment, is superb. 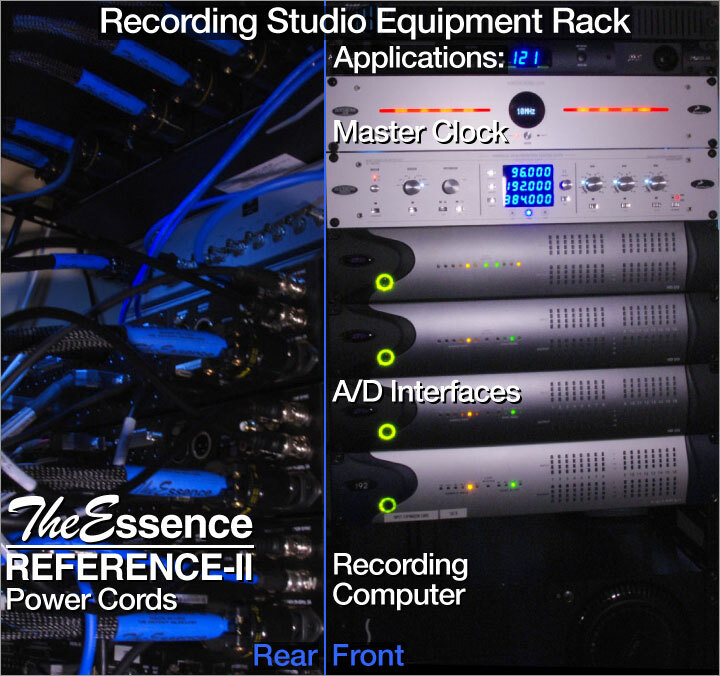 But like many modern studios, the recording components are connected by a network of hundreds if not thousands of feet of unshielded, cat-5 cable. Unavoidably intertwined with these signal-carying cables are unshielded power cords that connect to every component. Joe realized that this tangle of unshielded signal and power cables in back of every equipment rack represented a significant compromise to the studio's performance potential and indeed his investment. That's when Joe called us. Over the course of several months, Essential Sound Products worked with Bamboo Room to outfit the entire studio complex with various models of our shielded, high-performance power cables. We produced custom configurations of appropriate length and connector orientation to make for a neat, professional installation. The following images were taken as we completed the installation. Bamboo Room's control room is equipped with arguably some of the finest microphone pre-amps, equalizers and compressors ever made! The list includes vintage tube components made by Chandler, Demeter, Mindprint, Vintech Audio and SPL as well as the best new components from companies including AMS, AVID and Toft. 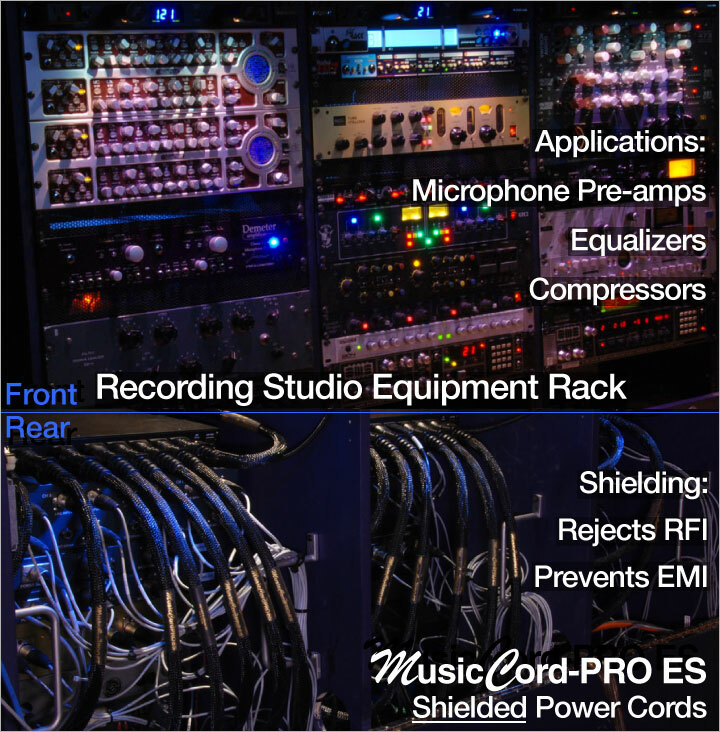 After evaluating several models, the choice for the majority of these components was MusicCord-PRO ES. 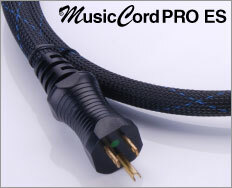 MusicCord-PRO ES was chosen for it's combination of performance that approaches our Reference products, yet offers greater value and affordability. All MusicCord and Essence power cords are based upon our patented cable geometry that includes spiraled line/neutral conductors around an oversized ground conductor and maximum coverage braided copper shield. 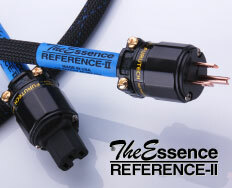 The cable's shielding effectively rejects RFI and controls EMI for quiet backgrounds. The control room features an AVID S-6 Modular Control Console that requires separate power cords for each of the five (5) sections. The control console is the heart of any recording studio and as such it's performance is critical. Reference-II power cords of various lengths were custom made for each section. Dynaudio 2-channel nearfield monitors and a 5.1 surround system with powered subwoofer provide recording/mix monitoring. All speakers were outfitted with MusicCord-PRO ES power cords. Several cords were specified with 90-degree IEC connectors to optimize power cable routing, avoiding walkways and allowing speaker positioning close to walls just behind the front monitors. In addition, several power cords are at the ready to use with guitar and bass amplifiers in the cutting rooms. The control console, master clock, A/D interface and recording computer are the "heart" of any studio. Everything that is recorded passes through these components. Bamboo Room is also endowed with some of the finest, state-of-the-art digital components including AVID S-6 control console, Antelope 10M Rubidium Atomic Clock, AVID HDX A/D Interfaces and Apple Mac PRO recording computers. These no-compromise components were mated with our no-compromise Reference-II power cords, hand-built and customized configurations where necessary.